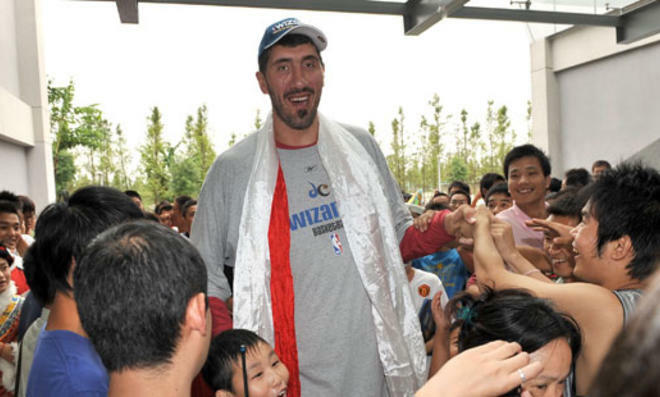 Do you remember Gheorghe Muresan? It all began in his home country of Romania in 1991. 20-year-old Gheorghe Muresan turns professional for Romania’s CS Universitatea Mobitelco team and the next year, played for France’s Pau-Orthez. Though he used his height to an extreme advantage, Muresan’s skills were not sharp; he was growing as a man, as well as a player. Once he hit the NBA draft in 1993, he worked his tail off with Washington Wizards trainers to hone his skills, and become an NBA center. Height is everything in the game of basketball. If the average human being sees a young boy towering over his peers, a frequently asked question would be “do you play basketball?” While it could certainly help you dominate the game, extreme height on the basketball court could derail a career very quickly. Standing a monstrous 7’7”, when drafted 30th in the 2nd round of the 1993 NBA Draft by the Washington Bullets, Gheorghe Muresan was an instant fan favorite. Looking like 92.4 inches of brick wall, Muresan could swat the pint sized basketball like a bug, rebound with ease, and use his impeccable height to operate in the post sinking a sweet hookshot into the net. Since Christmas also is the time of coming together and sharing old memories of friends and family, Rex Chapman told a funny holiday story on Twitter of Muresan, his former teammate.